Grammy award-winner Miranda Lambert knows what it takes to record a number-one album – she’s had four of them. And as a mom to six adopted dogs, she also knows what it takes to help the nation’s more than four million shelter dogs find their loving homes – access to consistent, professional nutrition so they look and feel their best. Miranda Lambert kicked-off the national search for the next communities to benefit from The PEDIGREE(r) Feeding Project, an initiative designed to help shelters nationwide. That’s why the country superstar is teaming up with the PEDIGREE Brand to launch a search for the next communities to benefit from The PEDIGREE Feeding Project: an initiative started in Nashville and Chicago that supplies participating shelters with 100 percent of their core dog food needs, at absolutely no cost. Lambert officially opened The PEDIGREE Feeding Project “Choose the Next Community” nomination period yesterday at The Americana at Brand in Los Angeles, Calif. She unveiled her latest video project that showcases her love of dogs and why this initiative is important to shelter dogs from coast-to-coast. As the world’s largest dog food brand, PEDIGREE Food for Dogs realizes it has the potential to impact more dogs’ lives than any other brand. That’s why it chose to focus on where it can make the biggest immediate difference – cities with an abundance of homeless pets – starting in 2012 with Nashville and Chicago. Already, more than 4,000 shelter dogs are receiving the professional nutrition they deserve through The PEDIGREE Feeding Project’s first year and now the PEDIGREE Brand is ready to help even more shelter dogs. As a result of the support from PEDIGREE Brand, shelters in Chicago and Nashville were able to save anywhere from $40,000 to $100,000 a year, which allowed them to participate in activities such as off-site adoption events, expanding the audience of potential adopters; as well as update their facilities to provide a more home-like environment for the dogs, which helps the dogs transition more easily into their new loving home. When dogs are fed a consistent diet of professional nutrition, they are happier and healthier while they wait for their forever homes. Beginning today, dog lovers can visit Facebook.com/Pedigree to nominate the community where they think The PEDIGREE Feeding Project can make the most difference in the lives of shelter dogs. •	Visit Facebook.com/PEDIGREE and click on the “Choose the Next Community” tab. 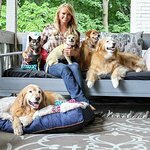 •	Watch Miranda Lambert ‘s heart-felt video on why The PEDIGREE Feeding Project is so important to her. •	Then, nominate your community. Submit stories of special dogs in your life, share photos and videos; PEDIGREE Brand wants to know what sets your community apart. •	Share Miranda’s video with your friends and encourage them to nominate their community, too. In March, Miranda and the PEDIGREE Brand will announce the names of the five communities that have been selected as finalists in the search. America will then vote to determine the next communities to participate in The PEDIGREE Feeding Project. The winning communities will be announced mid-2013.